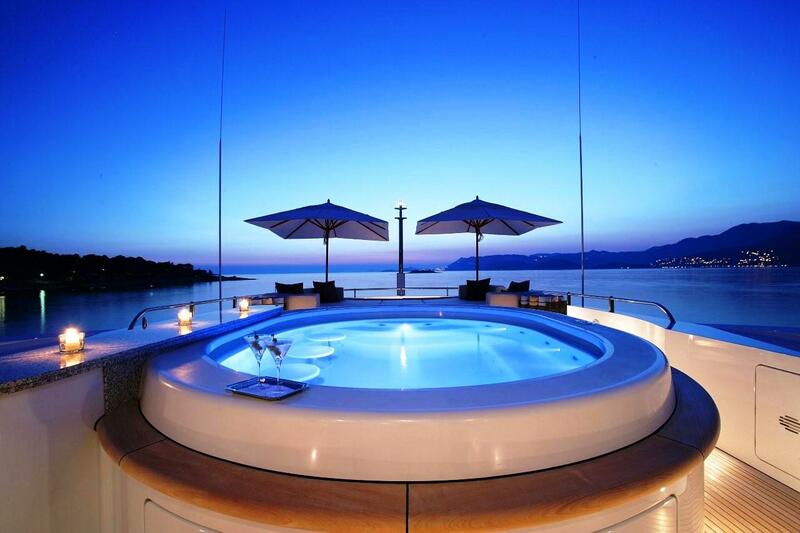 I love hot tubs and Jacuzzis. They are one of the best experiences in life. But owning your own Jacuzzi is so expensive and labor intensive that the only really good option is to live in a complex that has one. While this solves all the cost and labor issues it then creates the new issue of having to share the space with the rest of the complex. So a very nice compromise is to have a great shower in your bathroom. The privacy of your bathroom makes the shower a safe haven of relaxation. So your shower is an area of your house that you should take some time to really plan out when you are building a home or doing some remodeling. 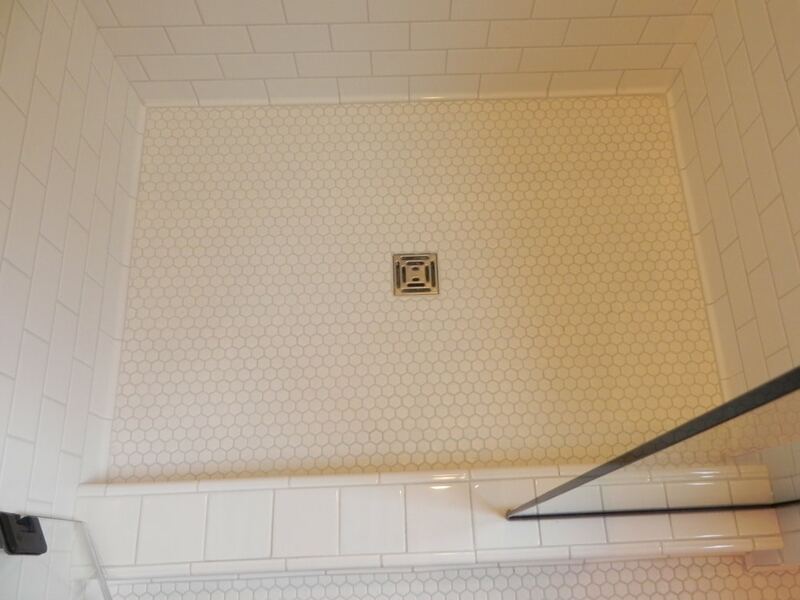 One overlooked area of the shower can be the floor. 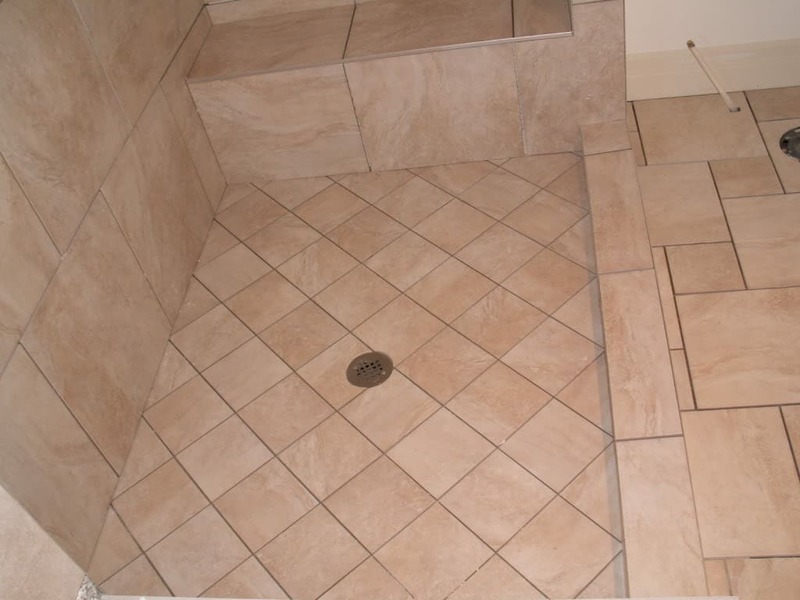 This small floor space presents a bit of a conundrum because it needs to be easy to clean, waterproof, beautiful, comfortable to stand on, and something that won’t cause you to slip and die when it is wet. The simplest solution to this is your everyday prefabricated shower insert. 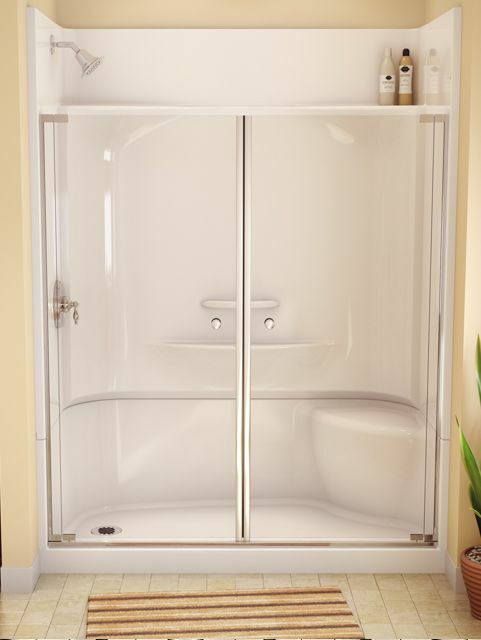 Shower inserts are acrylic surfaces that are molded into preset shapes that are easily installed in your bathroom area. They are affordable, easy to clean, waterproof, fairly comfortable to stand on, and they can texture the surface so that you won’t slip. But they are anything but beautiful. Perhaps I am too critical of these wonderful bathroom inventions, but so many cheap motels and apartments use acrylic shower inserts that I feel like acrylic inserts are to showers, what cheap Formica is to kitchen counters. With so many beautiful options out there, why shouldn’t we strive to be better than shower inserts? Here are 7 of the best alternatives to acrylic shower inserts. Let’s start with the three popular shower area stones. 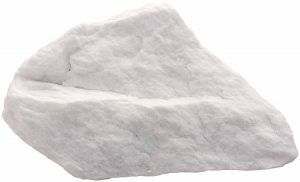 Marble, Limestone, and Travertine, as rocks, are all actually very similar even though they will give you different results in the form of shower tiles. According to my cursory geology google search, marble is a metamorphic rock that forms when Limestone is subjected to heat and pressure. To put it simply, as limestone turns into marble it becomes more crystal like and therefore harder, stronger, and more slippery. 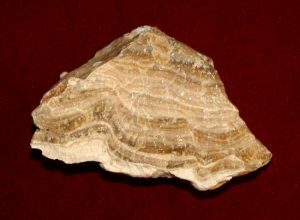 As I understand it, travertine is a stone that is halfway between Marble and Limestone. ALL of these stones are fairly porous so you WILL have to seal them. I have seen some pictures of some nice limestone showers. I would certainly prefer a shower with limestone tiles over a basic shower insert but I would be worried about how soft the limestone tiles would be. 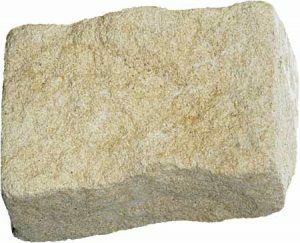 As I stated before, limestone is the softest between itself, travertine, and marble. (And even marble is a fairly soft stone!) So if you get limestone just be careful not to drop heavy sharp objects on the tiles as they will scratch or break. Marble is a very popular natural stone to use for bathroom countertops. Having matching shower tiles seems like a natural next step. Marble is a lot stronger than limestone and it will not scratch as easily but remember that it is still soft compared to granite or some other stones. Marble is not cheap. Whether it is earned or not, marble has a luxurious expensive look, feel, and reputation. So if you are planning on selling your home, you could look at marble as an investment. Travertine is one of the most used stones for shower tiles. As I touched on before, travertine is a happy balance between limestone and marble. Travertine brings you the best of both worlds by being stronger and harder than limestone but still being less slippery and cheaper than marble. 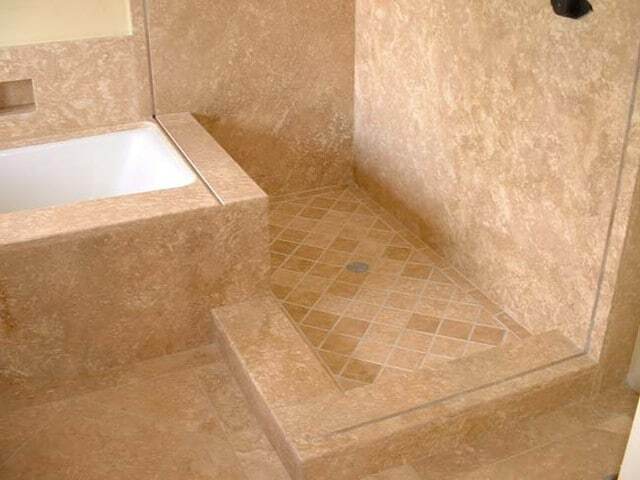 The light swirling color patterns in travertine make it particularly attractive in most bathrooms. Like marble, this durable stone will last a long time but you are less likely to slip and kill yourself on travertine. 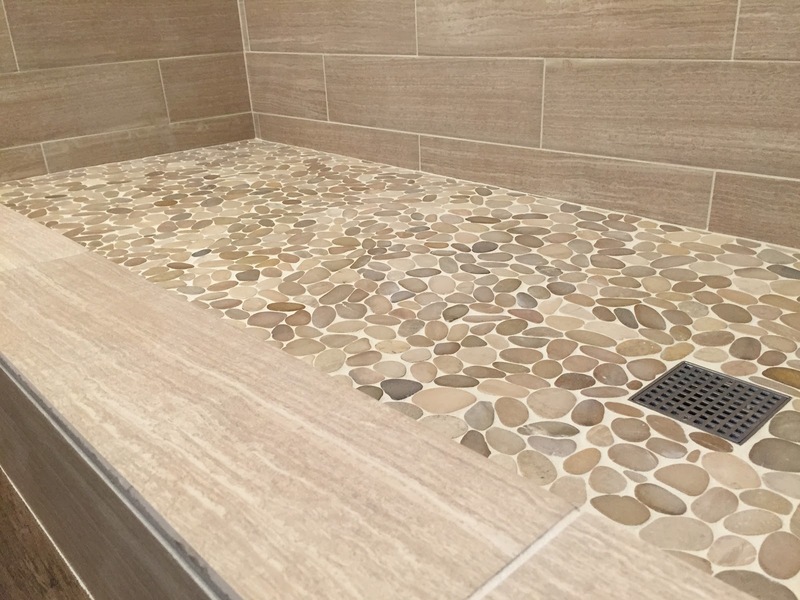 If you aren’t sold on natural stone tiles but you want a cool natural look to your shower, making the floor out of pebbles or small rocks can be a great option. 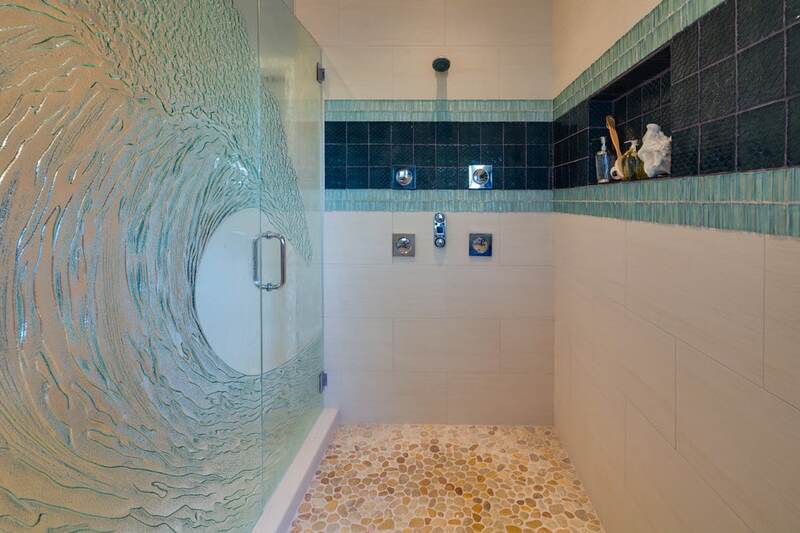 Due to the nature of this flooring pebble showers offer you a give-and-take sort of situation. On one hand you end up with a lot more grout that might need to be cleaned and the surface isn’t the most comfortable thing to stand on while showering, but on the other hand for the same reasons pebble floors are not very slippery. If rocks and stone tiles are not your thing; don’t worry. There are a number of other options that can make you shower floor look better and last longer than those ubiquitous prefabricated shower inserts. Glass tiles offer a different approach. Similar to stone tiles in that they look and feel great. Glass tiles have a nice look that’s different from stone because of how the light will play off the glass tiles. 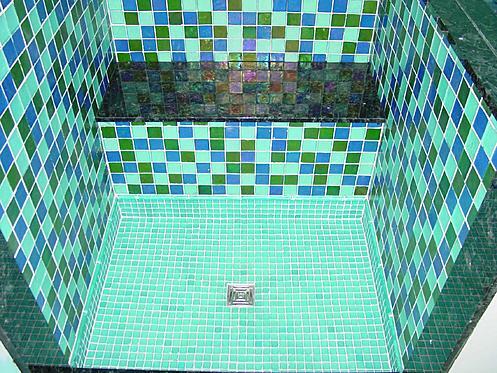 They are easy to clean with windex and you can get glass tiles in a variety of colors. The prices for these tiles range all over the map. The one real problem with glass shower tiles is that they are particularly slippery. If you are concerned about breaking a hip or worst, these beautiful tiles might not be the best option for you. 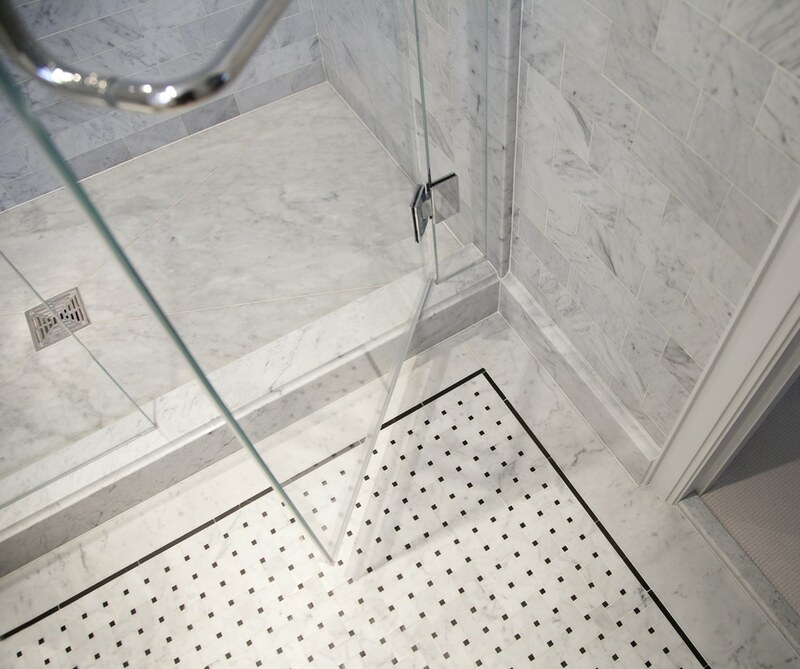 For many people, porcelain could be the best choice for your shower floor. Porcelain is a form a ceramic that is made from a more pure and refined clay that makes it stronger and a little more expensive. These durable tiles will probably last as long as stone tiles. White porcelain tiles will even match your toilet. But the benefits don’t end there; if you spend more you can get textured porcelain tiles that look like wood, marble or stone. It’s even easy to clean. For obvious reasons, a wood shower floor will completely change the look and feel of your shower and even your whole bathroom. Teak seems to be the most popular wood of choice but others like cedar are also available. Beautiful wood grain can add a warm comforting look to your floor. You’ll have to seal and maintain the wood or it certainly won’t last very long. 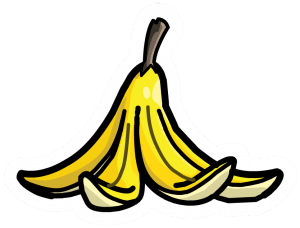 If everything is built and installed correctly you shouldn’t have a major issue with the wood warping or fading, but this is an issue you should be aware of anytime wood and moisture come into direct contact with one another. 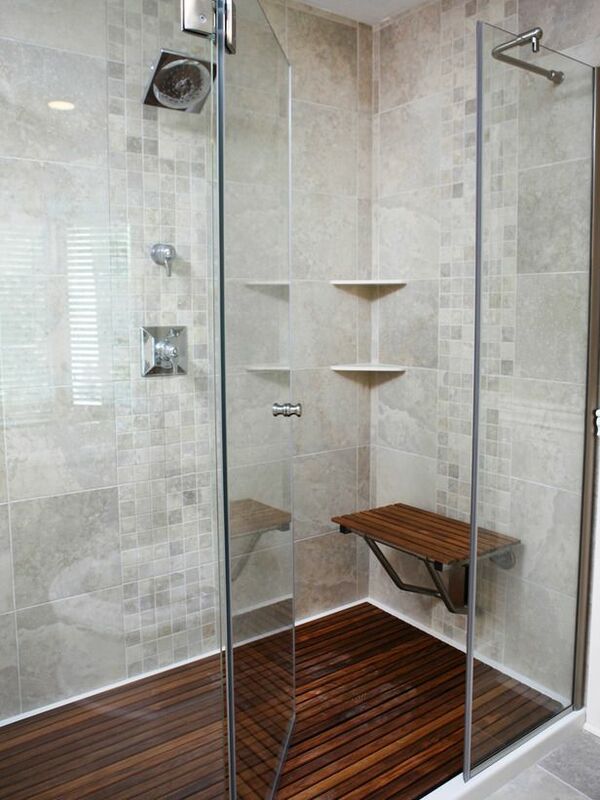 These floors look fantastic when accompanied by a matching wooden shower bench. A wooden shower floor will not last like stone or tile but perhaps the best feature is that they are usually made as removable inserts that lay on top of your existing floor. This means that replacing them is quick and easy and you still have your other shower flooring underneath. Wood is comfortable on your feet and you don’t have to worry too much about falling to your death. 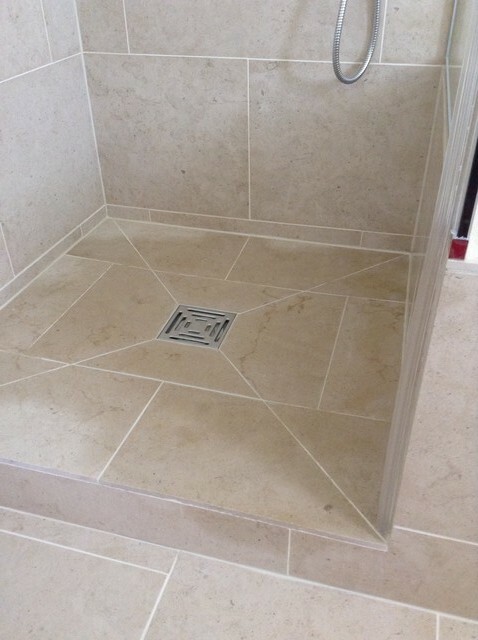 Like so many things in life, the perfect shower flooring for you will be largely dependent on your personal needs and preferences. There are a lot of great options out there for people who don’t want their shower to be #650,940 out of 2 million. If you want to spend a little more and get a great looking shower that will turn heads and feel great, find out what kind of shower flooring works best for you.